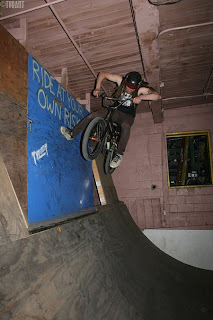 So I was fortunate enough to have a chance to ride Jay's ramp yesterday night. Back from 2002-2004 we rode the ramp pretty regularly, but I've only had 2 opportunities in the past 4 years! Jay lives an hour from the warehouse were the ramp is, he has a wife and kids, and runs a family business...his time on the bike these days is very, very limited! When I got the call that some guys were riding the ramp I was all fired up! Jay hadn't ridden in forever but he was still flying 100 mph around the ramp pulling off maneuvers the teenie bopper scenesters of present day would be baffled by. Can-can deck manuals, try it...impossible! Schmidt and TJ were sessioning the wallride all night and everybody was having a good time. Thanks Jay!